Last night we carved pumpkins, so today we made pumpkin seeds! I'm sure there are as many recipes for pumpkin seeds as there are for, oh say, chicken soup or lasagna. 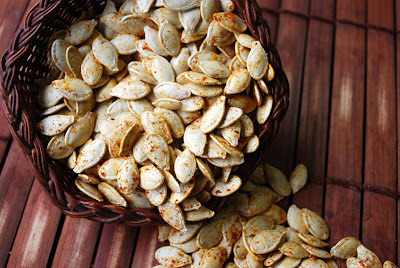 This is how I make pumpkin seeds, this is how I've always made pumpkin seeds for as long as we have been guttin' pumpkins. Rinse the seeds and remove as much of the pulp as you can. 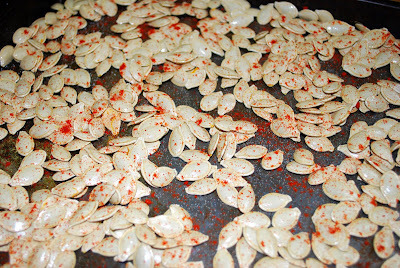 Spread the seeds out on a cookie sheet and let them dry for at least 8 hours, preferably overnight. Turn them every few hours so they dry evenly. Preheat the oven to 250. Pour about 2 - 3 teaspoons of olive oil over the seeds and toss them with your hands. Generously sprinkle them with table salt and smoked paprika. Pop them into the oven for 30 minutes. After 30 minutes take a spatula and turn them. If the bottom side looks like it needs a little more salt & paprika, go ahead and sprinkle a bit more on. Pop them back into the oven for another 30 minutes. Grab them back out of the oven and test a few to see if they are nice and crunchy. If they seem a bit chewy, put them back in the oven and check every 5 minutes. Place in your favorite bowl or basket and much away. 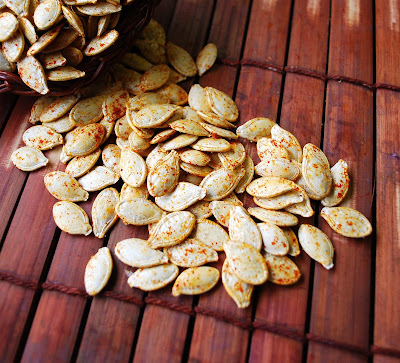 Yum, I love a good ole' pumpkin seed snack. Ok, I have a question.....do you "shell" the seeds like sunflower seeds before eating them? Ok, I'm feeling stupid here....am I the only one that ate them that way? If you answer, could you please email me or post on my blog...as I totally forget what blog has what and can't remember where I commented. Thanks so much!! !